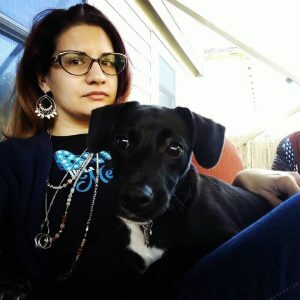 I’m a thirty-something CPA and animal lover; also a lover of food, gaming, and crafting; and native Texan. I’m also a mixed-race woman with strong opinions who enjoys talking and reading about religion and politics, but hates confrontation (hellooooooo internet platform for conflict without having to leave my house). I first started blogging in the late 1990s when blogging first became a thing. Now I’m a grown up with a little more sense (probably). I’ve owned this domain since about 2001, and in that time it’s transformed from a collective of websites around my interests, to a defunct holding page, to a blog. In a past life, I blogged from Rebel Yell, covering every topic that struck my fancy. In the intervening years since Rebel Yell went down to now, I’ve become a CPA, and gotten married and had a baby. I’m still passionate about food, politics, religion, and what it’s like to live in Texas, so I decided to restart my blog. Here you’ll find my opinions about a number of topics, and these opinions are not those of my employer, though I am aware that as a public-facing professional my opinions reflect on my employer. I try not to be intentionally offensive, but I know it’s hard not to offend people. Let’s try to have constructive conversations, even if we end up disagreeing. Theophany (from Ancient Greek (ἡ) θεοφάνεια theophaneia, meaning “appearance of a god”) refers to the appearance of a deity to a human. This term has been used to refer to appearances of the gods in the ancient Greek and Near Eastern religions. While the Iliad is the earliest source for descriptions of theophanies in the Classical tradition/era (and they occur throughout Greek mythology), probably the earliest description of a theophany is in the Epic of Gilgamesh. The term theophany has acquired a specific usage for Christians and Jews with respect to the Bible: It refers to the manifestation of God to people; the sensible sign by which the presence of God is revealed. Only a small number of theophanies are found in the Hebrew Bible, also known as the Old Testament.